For perfectly clean textiles in a professional environment. Sustainable cleaning is about the product and the use of it. That is why we make highly concentrated, ecological laundry detergents and combine them with intelligent dosage equipment. Doing so, we help you to make your cleaning activities more efficient, hygienic, safe and environmentally friendly. 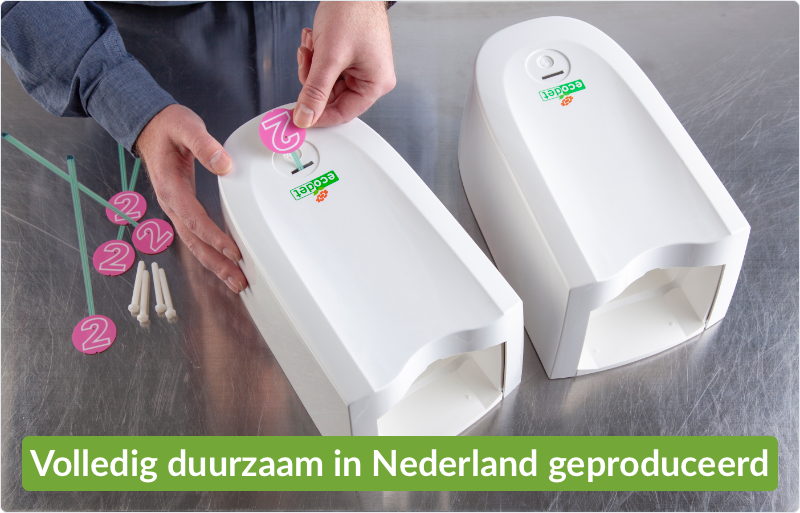 That is our mission: to reduce the total environmental impact of our products and decrease the total costs of cleaning. 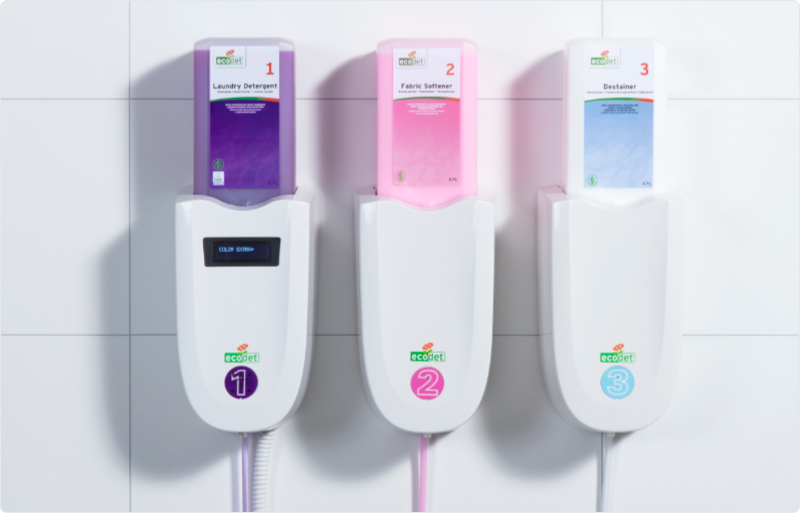 Intelligent dosing system with highly concentrated, ecological laundry detergent (up to 5 times more concentrated than traditional products) for perfectly clean textiles in a professional environment. Thanks to our unique 3-in-1 system is Ecodet Compact suitable for every situation. The system can dose fully automatic when using one specific type of textile. 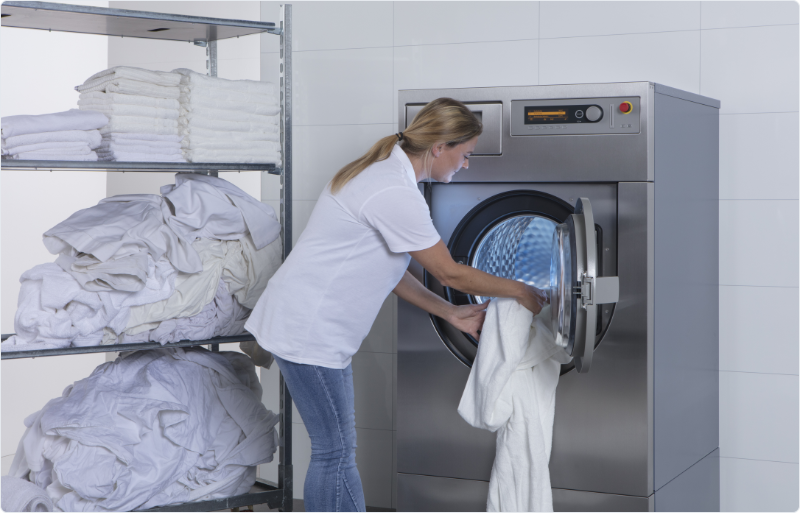 Standard washing machines can be equipped with an easy to use control panel when using different types of textiles. Smart washing machines can fully control the dosing system from the various washing programmes. 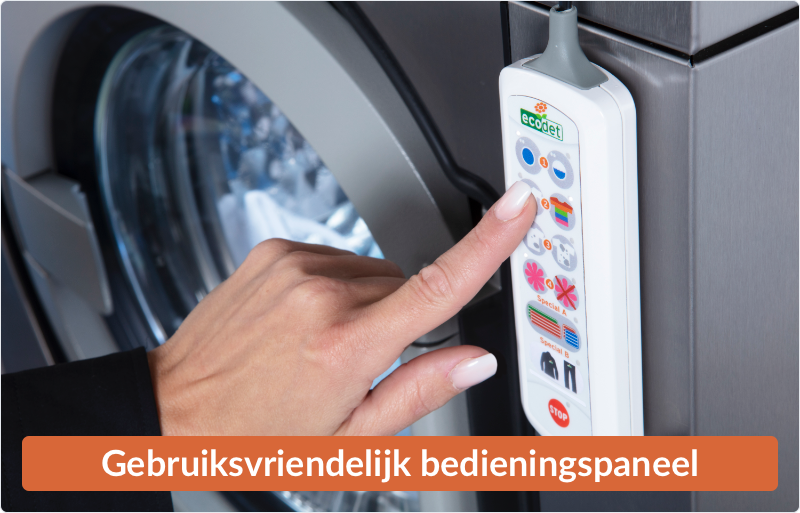 The intelligent dosing system gives complete insight in usage of the washing machine. With the data it is possible to control efficiency, costs, hygiene and the environment performance effectively. Due to efficiency, exact dosing and the highly concentrated laundry detergents, the costs per washing are extremely low. The dosing system is also low in maintenance. are many types of laundry, we advise you on the best suited combination of laundry detergents and train your staff. That way we guarantee a flawless use of the product, 24/7. The Compact system contributes to a safer and more ergonomic working area, thanks to the use of the clear number and colour coding, safety connectors and easy to handle light weight packaging. 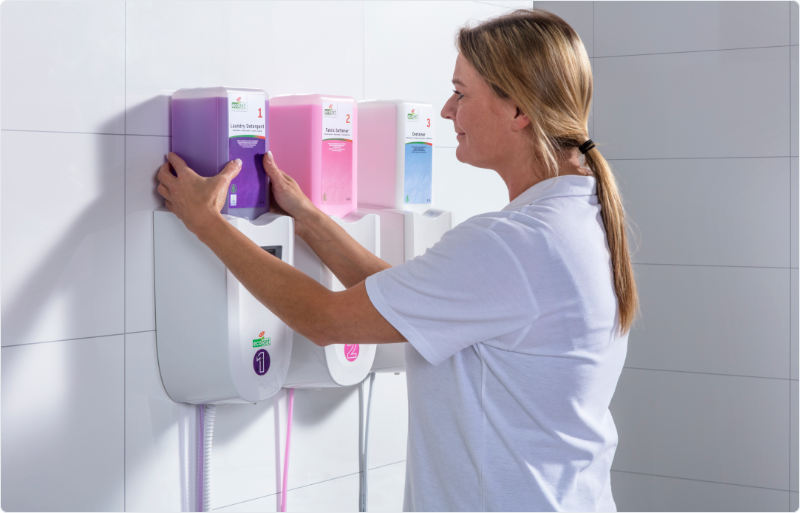 Due to the system being hung in an easy to access area on the wall, there are no longer any products on the floor, therefore: more ergonomically and hygienically. 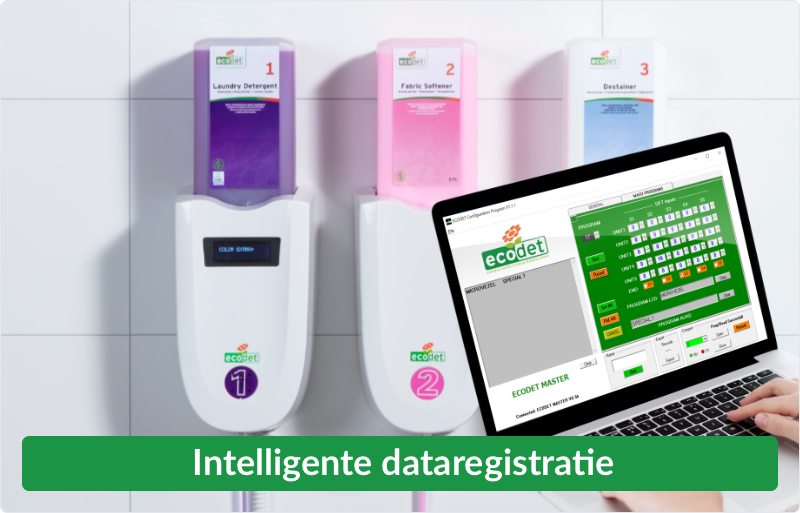 The highly concentrated Ecodet laundry detergents are, where possible, certified with the European Ecolabel. Less transport is needed, stocks can be kept low and waste is reduced to a minimum. Moreover, the dosing is very accurate and the cartridges are completely emptied. Highly concentrated, highly fragranced laundry detergent. Removes tough stains and guarantees clean and fresh laundry. Suitable for both white and coloured laundry.. Highly concentrated, highly fragranced fabric softener for softening and refreshing of textiles. Suitable for both white and coloured laundry (not for wool and silk unless specified on the care label). Highly concentrated, unperfumed destainer for the sustainable removing of stains and odours. Suitable for both white and coloured laundry (not for wool and silk). Highly concentrated, highly perfumed laundry detergent for all types of washable microfibre materials. Removes tough stains and ensures a clean and fresh microfibre material. Removes tough stains such as organic grease and oil stains. Inquire for our specialist products for your application.